Whoa, is Amazon on a roll these last few weeks or what! The company has been announcing new hardware, new services, improving existing offers, and more, all within the span of a couple of months. Today, it's Prime Photos' time, one of the free benefits that come with an Amazon Prime subscription. The service is getting a significant revamp and plenty of new options. First, there's Family Vault which gives any Prime member the possibility to share their Photos perk with up to 5 family members. 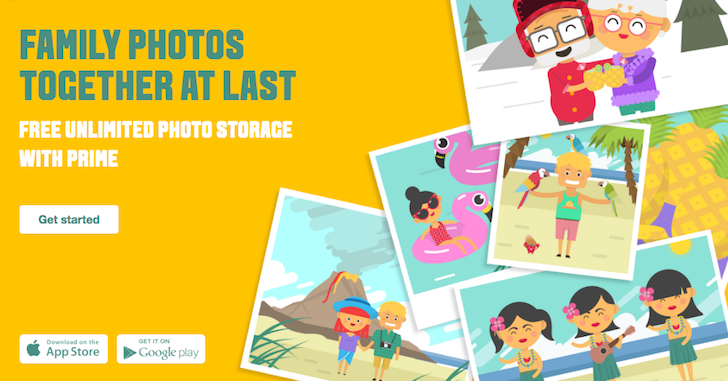 This means that the whole family can upload its photos manually (or they can set the app to automatically upload all photos) to the same Prime account. All members get the benefit of unlimited and free photo storage, with a limited 5GB available for videos and "other files." Second, Amazon seems to have improved its photo searching algorithms, providing features similar to Google Photos. It seems like it will do facial recognition and group photos of each person, and it will understand search queries like "sunset" or "wedding," though I'm not sure whether it's as effective or as detailed as Google Photos' smart search. (It still blows my mind that the latter can do searches based on emojis!) You can also filter by location or date if that works better for you. And finally, Prime members will be able to get free shipping on any printed photos from Prime Photos' web interface. All of these improvements only appear to be available for the US right now, so if you live in other countries, you might have to wait to get them. The Android app for the service has also received an update to add all of these features so you can start sharing your account's storage with your family members right away. SEATTLE--(BUSINESS WIRE)--(NASDAQ:AMZN) Amazon today introduced new features to the Prime Photos service in the U.S., designed for Prime members and their family. Prime members can now invite up to five family members or friends to join their Family Vault, which includes access to Prime Photos benefits including unlimited storage of photos, plus an additional 5 GB for videos and other files. With the all-new Family Vault, bringing family photos together is as easy as one-click or swipe from a computer or mobile device. Customers can start using the new features of Prime Photos today at http://www.amazon.com/photos or through Prime Photos mobile apps.